Sorry..long post. Couldn’t help myself. Kerala. God’s own Country. The place where I was born and brought up. My home. They say we don’t know the worth of our blessings until it’s taken away from us. When I was in Kerala, I never appreciated the greenery, the beauty and the laid back lifestyle. All it took was an year in Chennai to learn, love and respect mother nature’s blessings. When you travel in train, there is a noticeable difference in the scenery outside when you enter Kerala. It’s green and pleasant and many-a-times it might be raining as well. Rain is a big part of the life there. And unlike Chennai, we hardly had the schools off because of rains. Our old house has a well inside. Yes, inside the house. 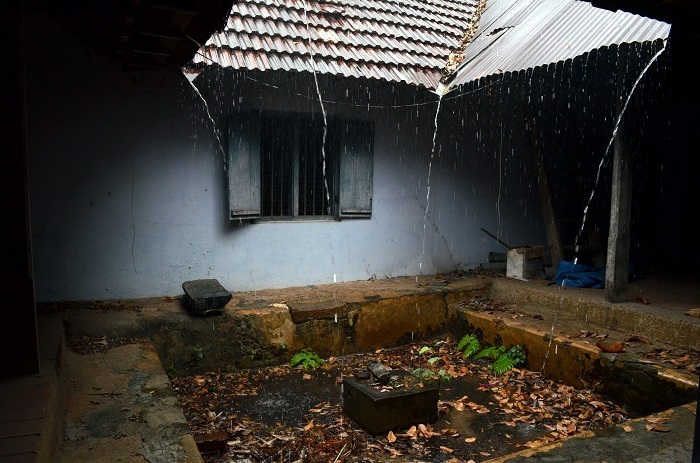 It was an old ‘nallu kettu’ style house, which has an opening in the middle of the house. Our favourite time pass was to watch the water flow in the small canals (oda) from our windows. We had two such openings, and so it’s an ‘ettu kettu’ veedu. It’s similar to the one below, but on one corner, next to the kitchen, there is a well. It’s in ruins now :-(, the house, I mean..the well is still fine. My place is surrounded by temples. Usually temples have a pond nearby and we have one right opposite our house. Now, during the rainy season, the water level inside the well increases. But it’s connected to the pond, so the excess water flows off to the pond via some hidden channel and the water level in the well is maintained without overflowing. It’s like marking a ‘maximum height’ point and then connecting to the pond using some pipes (made of what? No idea!!) once the water rises that level. And the pond is connected to a lake nearby. So there too, when the water level goes beyond a point, it flows off to the lake and hence never overflows. And yes, it was done centuries back. Some architecture, huh? But those were the good old days. Now, life is much busier, no one has time for anything, lots of trees are gone, building have come up like mushrooms and the rains are much lesser. The price we pay for progress! The good thing is, the food remains just as simple and just as tasty. That hasn’t changed. After covering the sadya recipes last September, I chose something basic from my native state this time. 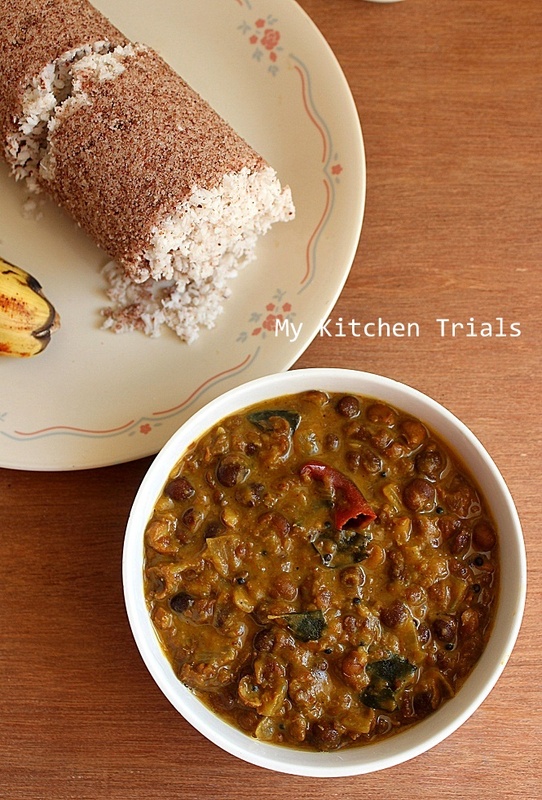 Something that you can begin your day with…Puttu and Kadala curry. Puttu is made with ground rice. The ground rice is then steamed with grated coconut filling in between. Earlier it involved soaking, drying and then grinding of rice. Now, all we need to do is pick up a ready-made ‘puttu podi’ packet from the supermarket aisle. In olden days, the steaming was done in hollowed bamboo stalk or in a coconut shell. Now we have stainless steel cylindrical tubes, just for this purpose. Puttu is a really filling breakfast. It can be served with a whole lot of curries. Kadala curry or chickpea curry is a famous combination. 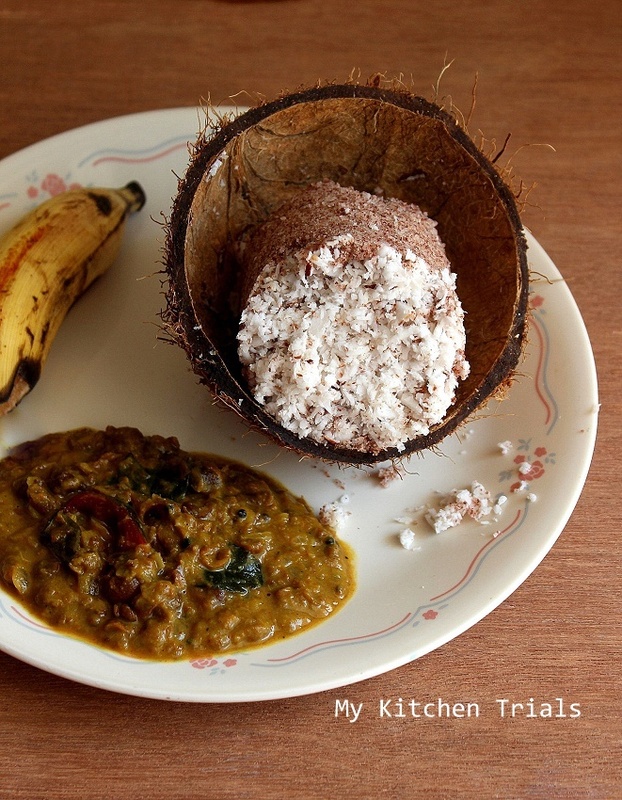 Mutta curry and whole green moong curry also goes well with puttu. But the simplest and the tastiest way is to have it with milk and banana. Break the puttu and then add a bit of milk to moisten it. Top it with sugar and eat it with a small piece of banana. Childhood memories :-) (Not quite childhood, I still do it :D). Food has a lot more to do with familiarity than the taste itself. Something that’s tasty for me doesn’t appeal that much to my husband since they weren’t brought upon it. So I don’t make this at home as much as I would love to, because my husband and my son are not from Kerala and they don’t have a connection with this food as I have. Well, that’s the way of life.. 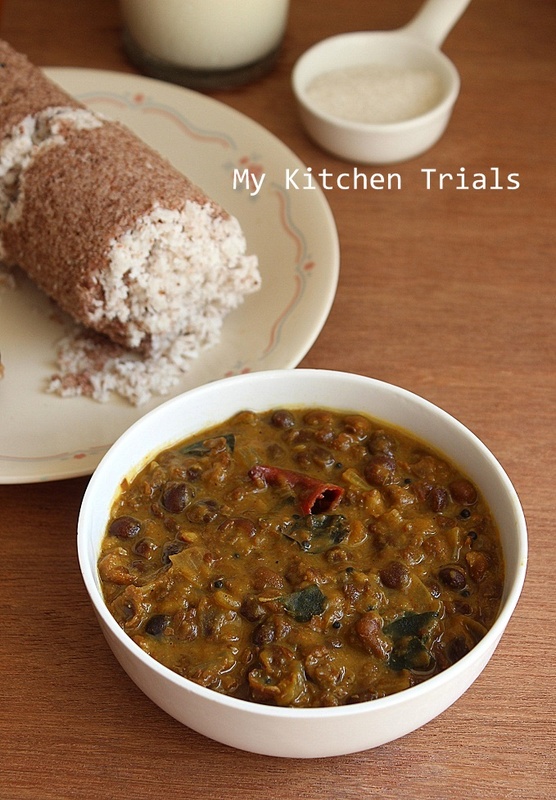 Anyway, scroll down for kadala curry’s recipe and the link for puttu. For making puttu, check out this link : Puttu. There are step wise pictures, making it easy to understand. For the curry, the recipe is below. Wash and soak chickpeas overnight. Pressure cook the next morning with salt and enough water to cover the chana. After the first whistle, lower the heat and cook for 20-25 minutes to cook the chana thoroughly. Take off the heat and once the pressure drops, keep it aside retaining the water in which it’s cooked. In a kadai, heat the oil. Add the mustard seeds, curry leaves and red chillies. Once the mustard crackles, add the chopped onions. Saute till pink and add the ginger garlic paste. Cook for a minute or two. Add the chopped tomatoes, if using. Cook till it’s a bit mushy. Add the spice powders. Saute till it’s a bit brown. Now, add the chana with the water in which it’s cooked. Check and add salt (keeping in mind that we have added some while cooking the chana) and adjust the other seasoning as well. Let it simmer for about 10 minutes, stirring now and then to avoid burning. You can add more water if the curry thickens too much. Ideally you can stop when the gravy is not runny any more and is slightly thick. If you want more gravy, you can grind half a coconut into a smooth paste and add it to the curry along with a cup of water and let it simmer for sometime. I added coconut milk powder with 3/4 cup of water and let it cook in low heat for 5 minutes. Serve with puttu, aapam or even rotis. As kids (even now :D), we would add milk to moisten the puttu, then add a bit of sugar to it and eat it with a banana. A pappadam to this would take it to the next level :).Puttu goes well with kadala curry, green moong curry, spicy egg curry. It pairs well with pappadam as well. This kadala curry will go well with aappam as well. My friend sometimes pressure cooks the chana in the night without soaking. She then lets it rest in the cooker overnight. That way you don’t have to wake everyone up by using the cooker in the morning. And no soaking as well. Brilliant! Takes me back to my trip to Kerala and my stay in a village.reminds me of the rustic houses there…infact my hubby has always dreamt of such a house and says he wants to live in Kerala after 60. ! If you remember the house we live in has a similar concept where we watch the rain and feel the atmosphere. The putti brings back memories of my buying a putti maker, which I have never used:(( . Hope to get inspiration to use it..both the dishes look amazing and divine. you made me cry almost…feeling guilty for not sure what…:) lovely post…i had seen this picture of your home elsewhere in one of your post..your heart and soul are clearly living there.. I wish you are able to cherish it forever ..you are anyway doing your bit by sharing such wonderful recipes with us..
What a beautiful post Rajani…your pictures are so good and nostalgic! Reminds me of my many trips to kerala and enjoy this breakfast..love puttu kadala..:).. It is always said – home sweet home.. Loved the pic of the house with well inside, but sad that it is not in great shape.. Even our house in the villages have this type of houses.. It is so peaceful and beautiful there!!! Omg, thats so heartbreaking, i miss my grandma’s home here, our village house is almost like this with backyard trees and all. Puttu and kadala looks fabulous Rajani, its reminds me that i havent prepared this combo since a long. Lovely post Rajani. Reminded me a little of life in Goa. We too had a pond that was connected to a bigger water body. You seem to have such happy memories of Kerala. The combo you have presented looks great. That kadala curry looks so creamy and delicious. I can feel your love for your hometown.. home is the best place. nothing can match up. love the quaint old house. our old house in chennai also had an open courtyard in the middle of the house, we call it mutram.. Basic food always warms our hearts, Rajani!! Superbly written post! Wow, you have virtually taken us to Kerala.. Kerala in my dreams is exactly like you described — greenery, rain, temples and pond.. Mmmmm — I wish I could go there on a vacation. Both puttu and the curry look awesome. Rajani you have a gift with words. You took me on a trip to my childhood when I visited my gr.. Grandmother. I wanted to make puttu kasala but the equipment and the entire recipes seemed so daunting that I backed out. You have explained it beautifully.. Such a nostalgic post! My maternal grandparents house also has such an opening in the middle of the house, but no well off course. I visit that house last summer during my India visit after almost 18 -19 years, my grandparents house. Reading your post reminded me of that village. Nice breakfast and puttu is something I want to try. Wonder how it tastes and have read a lot about it in the blogsphere.